Lindy BNX-60 review | What Hi-Fi? The headphone market has grown exponentially in recent years. Whether you want a cheap pair or you feel like breaking the bank, and no matter the features you require, there’s more choice than ever. That competition has invariably meant cheaper prices – and products like the Lindy BNX-60 headphones: a pair of wireless aptX Bluetooth headphones, complete with active noise-cancelling technology, for less than £100. 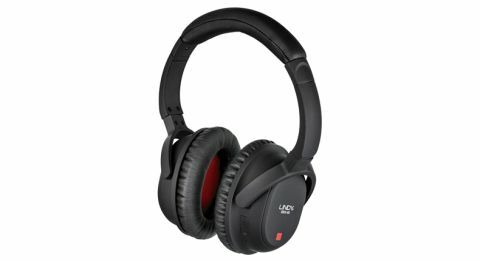 But before you dismiss these budget earphones, remember the Lindy NCX-100 headphones - a £100 pair of noise-cancelling headphones that garnered a respectable four-star review. The Lindy BNX-60 headphones look to build on their success, while adding the small matter of wireless functionality. The Lindy BNX-60 headphones cut a more compact figure compared to their predecessors. The adjustable headband is slimmer and the earpads not as deep or chunky. They offer a comfortable, snug fit for an average pair of ears (without being quite as warm as the bigger model) and do a reasonable job of basic noise-isolation. One ear has a volume control, the on/off switch for the active noise-cancellation and a blue light that indicates when the ‘ANC’ feature is in use. The other ear has the USB input for charging, pause/play/skip track controls, a Bluetooth connection light and a standard wired headphone output. They come with a solid black carry case, a 6.3mm adapter and a plane adaptor. There’s a detachable headphone cable but no in-line mic or remote control – the mic and controls are instead on the headphones. For wireless sound and noise-cancelling you need power, and the BNX-60s get their juice via USB – just connect to a computer or mains power. This is a notable improvement on relying on AAA batteries. A full charge is good for 15 hours of wireless music, or a little less with the active noise-cancelling. Connecting to a phone or tablet over Bluetooth is simple; press and hold the power button to make the headphones visible and then select the headphones on your device. The fact it all works seamlessly is already something of a victory. We don’t recall ever reviewing a pair of noise-cancelling and Bluetooth headphones this affordable, so you’d forgive us for being pessimistic about the performance. But it turns out that our pessimism is misplaced. We brace ourselves for bright treble or booming bass, but instead the Lindy BNX-60 headphones deliver a balanced sound that’s easy to listen to. The bubbling bass on Midland’s Blush sounds clear and detailed, while the stuttering hi-hats are kept in control to keep the track ticking along nicely. Thundercat’s Them Changes shows these headphones can deliver a groove and also do a decent job with vocals. Stepping it up a notch with Biffy Clyro’s On a Bang and the BNX-60s take the screeching vocals and driving guitars (and the swearing) in their stride. So far so good. Vocals do sound a little muffled at times, putting the focus of the presentation on the bottom end instead, but the headphones manage to turn this to their advantage. Noise-cancelling tends to accentuate the treble, and turning it on brightens up the tonal balance quite satisfactorily. We expect a slight drop-off in sound quality from noise-cancelling cans but we’re pleasantly surprised that turning it on does little to affect the overall sound. It does a solid job of blocking out external noise, too, if not as capable in this department as the (much more expensive) Bose QuietComfort 35 headphones (£300). We’d expect a slight step-down in sound quality with wireless but slight is certainly the word here. Lose the wire and there’s not quite the punch and focus but it’s still a more than adequate budget wireless sound performance. The Lindy BNX-60s are probably not a set of headphones for the discerning audiophile. But as a great value pair of noise-cancelling headphones with the added bonus of wireless Bluetooth, we can’t quibble with what’s on offer here. If you value the functionality, we don’t think you can go wrong.